Please Note: This Audio Package is Suitable For Therapists Only! If you’re already using the PSTEC click tracks with clients then it’s almost a certainty that you already know how astonishing they are. On this new audio you’re going to be introduced to another unique therapy method. 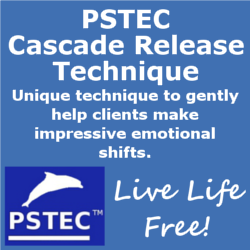 This is yet another new way to release people from a wide variety of problems and when you use it you’ll find that this is really very different indeed from the standard PSTEC techniques. You’ll be taken step by step through the thinking that led to it its creation. That’s because you need to understand it. You’ll also learn about the real life client treatments that led to the creation of this PSTEC technique. This was created as a companion tool for PSTEC because it provides real variety and lots of flexibility in terms of how you can use it. As PSTEC evolved, most of the other techniques Tim designed found their way into the standard process but PSTEC Cascade release is different. This can be less predictable but works especially well for certain clients. It’s so significantly different it remains as a useful standalone technique in its own right and this is why it’s been made available. There’s lots to learn and more therapist involvement if you wish, but you can also sit back and let audio do most of the work instead. That’s because you’re being given a number of different ways to use it. In fact this technique can really pay dividends because it’s so flexible you can play around with it and shape it to your own style. You may want to learn how to deliver it yourself with your own voice (a full example script is supplied). Just in case you want to save your voice though, or learn while you work, you also get an audio version and an additional separate click track. As you’ll discover, you can use this with the percussive elements or you can use it completely without. The choice is yours. Because this technique can be used in a wide variety of ways and also because all of the supplied audio is completely optional, you’ll have access to a tool which can be used in almost any situation for almost any problem and by playing around with it in all of it’s varied forms you’ll learn and practice new skills in your own time and in your own way. Use your own voice and develop new skills. Or use the audio (supplied) if you wish. Use with a wide variety of problems. Complete with full example script and also includes a click track without voice over. Can be combined with other techniques to produce a hybrid therapy. Provides variation and choice when working with clients.